A regular car has lots of “deities” inside it. The alternator is one of them. This acts as the power god which manoeuvres pretty much everything inside a car and which uses the power from the engine to recharge the battery of the car. 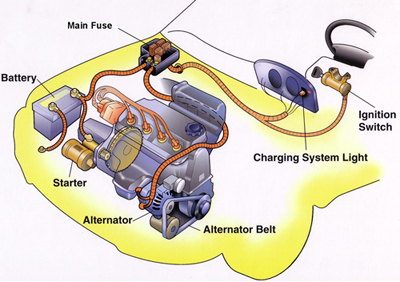 An alternator produces alternating current (AC) that powers the headlights, the radio, GPS navigation systems, electrical seat heaters, DVD players, etc. As one can see, the electrical load handled by the alternators and the batteries is extremely high so it’s no wonder that alternators are bound to give up their fight for humanity much faster. How do you know that your alternator is dying? You won’t be able to start your engine or other accessories and you will have to take the bus to work. That doesn’t sound so well, does it? The best thing you can do is make sure your alternator remains in a good conditions for as long as possible. How do you maintain it and how do you test it to see if there are any problems? Here are 3 easy tips perfect for alternator maintenance that can save you the trouble of replacing your current alternator. 1. The voltmeter – this is a device that measures the electrical output of a device. You need to start the car, make sure the accessories are turned off and get the engine in an idle position. Choose the DC scale on the voltmeter, then connect it to the terminals of the battery and read what it says on the device. Initially, the voltage should read 14 volts. However, when you add the electrical devices (heater, radio, etc.) the voltage should not drop below 12 volts. 2. Keep the alternator clean. It goes without saying that you need to keep your alternator and the case clean, the air vent holes open and always check it for dust. Remember that these accumulations of dirt, water or oil can block the ventilation and harm the components on the long run. 3. Good solvents – If the situation requires it use a good solvent that can remove dirt accumulations but don’t use chemicals compounds that can contribute to the deterioration of the insulation. Try using standard solvents, petroleum spirits or kerosene if the instructions offered by the manufacturer allow you to. Even some light petroleum solvents may prove to be efficient, but their use must be followed by flushing oil usage. The good news is that alternators can be replaced. The bad news is that you cannot do it at home. You need to visit a mechanic that has done this before and knows exactly how to handle things. If you are curious about how an alternator works and how it can be changed you can click here and watch an interesting and accurate animation.